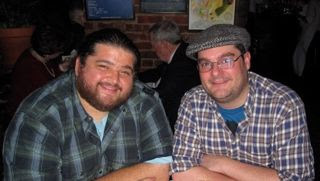 So the night I did the NY Times talk with Damon, Carlton and Michael Emerson I hung out with Bobby Moynihan from SNL. It turns out he was a huge LOST fan and even met me once before when I was in NY for the Todd McFarlane toy release. 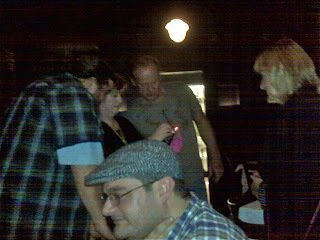 My favorite part of the evening was when Kelsey Grammer came over to our table to congratulate me. We had both been in the movie Good Humor Man together. Suddenly these two Scottish women were right on his heels asking me for a picture. Without missing a beat, Kelsey volunteers to take it. They had no clue who he was. You and Todd look pretty similar. I think it's the hair.. Coincidence? I think not. Cograts from here too for completing Lost! Tienes que volver a España!!! Do most actors like it when they aren't recognized and are left alone? I would think the constant requests for photos would get to be annoying after a while. We've had our share of celebrities here in our little town of Wolfville. Mel Gibson was here once scouting out movie locations, the eclipse scene from "Delores Claiborne" was filmed in the arena so we had Christopher Plummer, Kathy Bates, and those guy living here for part of the summer. Denis Leary and Sandra Bullock were here filming scenes from "Two If By Sea" and right now Jason Priestly is around taping a show called "Call Me Fitz" (now in post-production). From all accounts, I think that celebrities aren't swarmed when they come here. I think people tend to, for the most part, leave a respectful distance. I wonder if most celebrities would feed off the attention and would miss it or would be happy for the anonymity. I was an extra in the movie "Julie Walking Home" and I would say there was one guy in that movie that needed to be noticed. He acted *more* when the camera was off so he wouldn't lose the attention (I suppose). 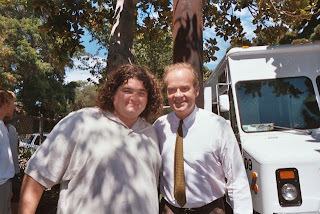 I'd rather have my picture taken with you than with Kelsey Grammer as well (though I'd know who he was). What a great story, and kudos to you both for being such good sports! Great stuff, Jorge... i mean Jacob... I mean #1. I love it! Thanks again for sharing little snippets of your lives with us. To me, the LOST finale was PERFECT. It made my heart so happy to see that Jorge and Emerson got a couple of really meaningful scenes together because I know your friendship is important. Wow. KG taking the photo for you. That is surreal. Cool story. Thanks for sharing it. I started to watch Lost about 3 years ago just to see what the whole deal was about. Had not really paid attention to it, thought it was a reality show. One evening, at a loss for quality tv viewing, we decided to see what the fuss was all about. We got hooked that night. We (missus) had to catch up, so, to the internet to catch up on the episodes, all the way from day one. We stayed up late watching each season. We rented videos...finally we got caught up. Then I found this blog. :) More fun. Wish you and the cast the best in your new endeavors! I hope Bobby wasn't too sad about it.. Gratz on the series Jorge and hope you continue these posts.. Life is not over after lost and I hope we see lots more of you. Thumbs up! That is so awesome. I remember watching an episode of SNL and at the end of the show he was sporting a Dharma hooded sweatshirt and displaying the emblem to the camera. Love that dude. He has really come into his own on SNL. Jorge, How am I just now learning about this blog? Thanks for an awesome 6 years and the greatest TV show ever! To make matters worse, Kelsey then stepped on a rake and got smacked in the face. Frasier and Lost - two classic top ten tv shows. Too Cool. Sounds like a really good day. I went to the LOST comedy show at UCB in NY Saturday before the finale. There were a lot of funny character bits and sketches. 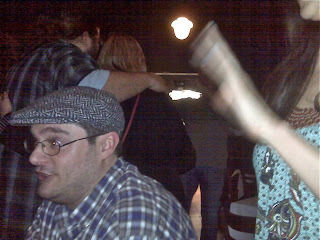 Bobby Moynihan came out as the last guest of the evening and said he didn't have a bit to do. Instead he revealed to everyone there how big a fan of LOST he really is. He had a slide show of pictures (including the two you've posted) plus about a thousand more of him with all his LOST memorabilia. As funny as the whole evening of LOST themed humor was, his part was totally sincere, funny, and touching and it really made the show.